Students in Higher Education Institutions 2011/12 shows that 787,205 higher education qualifications were awarded by UK higher education institutions (HEIs) in 2011/12. Approximately half of these qualifications were first degrees, one third were postgraduate qualifications and one sixth were other undergraduate qualifications (such as foundation degrees, credits and diplomas of higher education). 39% of all qualifications were awarded in science subjects, although 64% of postgraduate research qualifications were for science. 57% of all qualifications were awarded to women, and 25% were awarded to non-UK domicile students. 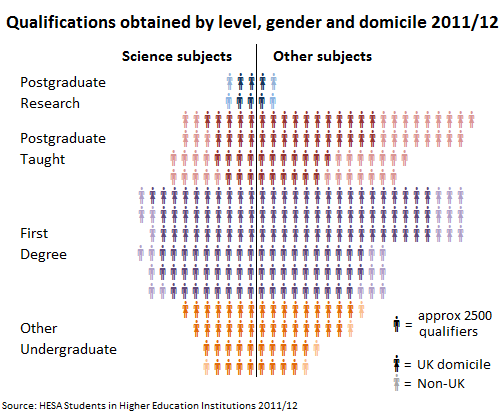 The graphic and table below demonstrate the breakdown of qualifications awarded by level, subject, domicile and gender. Roughly the same number of science first degrees were awarded to women and men. In other subjects 58% more first degrees were awarded to women than to men. Nearly half (47%) of taught postgraduate qualifications were awarded to non-UK domicile students. Students in Higher Education Institutions 2011/12 is a downloadable publication which includes comprehensive data on students and qualifiers broken down by demographic and course characteristics. Students in Higher Education Institutions 2011/12 is available to purchase now. Further tables and graphs from Students in Higher Education Institutions 2011/12 are published as free online data tables and in the publication's introduction. HESA student data is collected from all publicly funded Higher Education Institutions (HEIs) in the UK, plus the University of Buckingham, which is a non-publicly-funded institution. The 2011/12 data covers 163 HEIs (131 in England, 10 in Wales, 18 in Scotland and 4 in Northern Ireland). Equivalent tables for England, Wales, Scotland and Northern Ireland can be found in the Annex below. More data on qualifications obtained can be found in Statistical First Release 183, the Free Online Data Tables page and the publication introduction. Definitions of the terms used in this press release can be found online here.